For over forty years, following a career as an international model and actor, Rudi Patterson dedicated himself to painting. From the three successive council flats he lived in around Notting Hill he produced a vast body of work, exhibiting widely in London , the UK and internationally – from New York to Melbourne - throughout the 1970s, 80s and 90s. 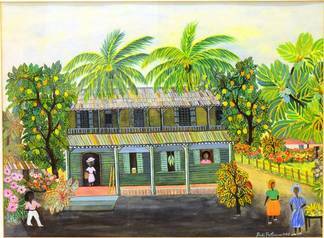 Following his death last year, this exhibition explores a single theme; Rudi’s extraordinarily potent and vivid representations of his native Jamaica. Including many works never previously exhibited, these depictions of montane landscapes, plantation villages, luxuriant tropical vegetation, rivers and beaches conjure a compelling sense of place, intuitively made from the vantage point of a West London window. 'I'm a Jamaican, I love my island and its beauty." Rudi Patterson was also a proud Londoner and Briton. His vivid portrayals of home were mostly created from three small painting-bedecked flats in Kensington and Chelsea. At the time of his death in July 2013, almost all the pictures in this exhibition were in his flat next to Trellick Tower. Rudi was born in September 1933 in the sugar plantation village of Duckenfield, St. Thomas, in the lea of the Blue Mountains, lush and tropical, where rain comes suddenly and often. After studying in Kingston, in the late Fifties he set off to London to become an actor. He took classes at RADA and through the Swinging Sixties and into the Seventies he was frequently on stage and celluloid. He acted in such classics as Z Cars, The Professionals and the Rolling Stones film Sympathy For The Devil. His modelling success was unprecedented for a black man in that era: British Airways, Mr Fish, a big jeans campaign. Appearances in repertory and West End theatre included the ground breaking gay-themed The Boys In The Band and in 1977 the world premiere of Michael Tippett’s The Ice Break at Covent Garden. Entirely self-taught, he began to draw and paint in 1969 and incessantly so during months of convalescence after breaking his neck water skiing in 1973. Over four decades he created around 1000 pictures as well as hundreds of ceramic pieces, delicately glazed pots, sculptures and platters. He painted in gouache,watercolour, acrylic and oil. In later years he produced colour-drenched abstracts and still lifes. When wracked by back pain he created vivid linear works. Rudi was involved in some 40 exhibitions including one man shows on four continents encompassing London, Manchester, Jamaica and even Australia. London allowed his creative juices to flow. He was at home in every milieu the city could offer; aristocratic, thespian, bohemian – a keen gallery goer and cultural activist. He witnessed both London’s decline and ascent, participating in its evolution from imperium to diversity. He loved the Notting Hill of market, Carnival and Absolute Beginners and lived through riots, Rachman and meterosexuality as his generation changed post-war Britain. 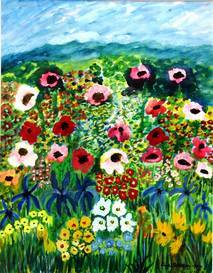 "I'm inspired by natural beauty and harmony, I love to paint." A Jamaican, even the city dweller or diaspora member, finds his or her story in landscape. This exhibition is filled with sonorous landscapes - montane, agricultural, domestic, peopled. Through these everyday and yet unfamiliar scenes, laden with cultural and social references, Rudi Patterson’s visions of colour open the gates of memory, addressing his people’s story. Jamaican society was created despite displacement and noted for its defiance, its irieness”.What you see in these paintings is not as edenistic or arcadian as it seems. Rudi’s remembrances are seldom singular in their meaning. 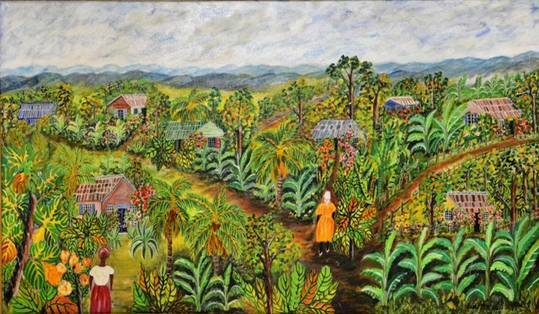 For those unfamiliar with island life, the depiction of an orange or mango harvest can be appreciated simply for the intricate representation of the fruit laden branches or vibrant use of palette and tone. The cleverly skewed perspectives, the ripeness of the fruit, the solidity of the mountains are all evidence of the artist’s skill. But if the garden is so magical why are the people often looking away? In a Patterson painting the many rivers to cross are not metaphorical; most Jamaican kids of his era had the chore of journeying to the river every day for water. Colonial, Depression and wartime era Duckenfield was tough. Crops are not for decoration but sustenance. Most dwellings are small. Order is disrupted by hurricanes. Nature’s colours clash. Slavery was instituted to grow plants with ruthless efficiency and was a not so distant memory in Rudi’s youth. But it was the very abundance of indigenous species cultivated in the rich red soil; the endless varieties of fruit and vegetables such as mangoes, ackee, breadfruit, cocoa - perhaps 40 in a small back garden plantation - that enabled Jamaicans and other West Indians to emancipate themselves from physical and mental slavery and to become, like Rudi, creators in new and old worlds. "Intuitive”was the term he used. These powerful images came into his head like the duppies (Jamaican for ghosts) he remembered from childhood evenings walking down unlit lanes. The took weeks of work – perhaps assisted by an image from a book of historic plantation houses, a potted tropical plant or a trailing purple Tradescantia pallida in the window. represent the New World, but a world inextricably yoked for centuries to Western classicism. There are whiffs of Impressionism, Rousseau, Lowry, Fauvist colours. Patterson presents a uniquely recognisable painterly style. He manifests memories of lush orchards, the beauty of hibiscus, the powerful wind tilting the palms, the engulfing heat of bush fires and recreates his heritage within the four walls of a Notting Hill concrete high rise. Exhibition texts written by Wesley Kerr and Novelette-Aldoni Stewart, co-curators of the exhibition. Leighton House Museum is the venue for the stunning exhibition Ferozkoh: Tradition and Continuity in Afghan Art, presented by the Museum of Islamic Art (MIA), Doha, as part of Nour and Qatar UK 2013 Year of Culture. Ferozkoh is the result of a collaboration between the MIA in Doha, Qatar with students and teachers from Turquoise Mountain Institute for Afghan Arts and Architecture in Kabul, Afghanistan. The unifying ambition of the exhibition is the preservation and continuity of the traditional arts of the Islamic world – in both themes and materials – in the present day, and the role of education in both transmission and translation. Ferozkoh comprises 18 pairs of objects. Half are historical objects from MIA’s collection; the products of four great dynasties with connections to Afghanistan: the Ghaznavids, Timurids, Mughals and Safavids. The other half of the works were created specifically for the exhibition by Turquoise Mountain students in response to, and in conversation with, the historical objects.